IAM Executive Assistant Diane Babineaux (right) led a strong delegation of Machinists union members to the Coalition of Labor Union (CLUW) convention in Los Angeles. 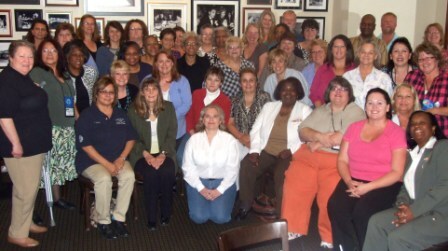 The Coalition of Labor Union Women’s (CLUW) 15th Biennial Convention concluded in Los Angeles, CA, after four days of collaborating on ways to strengthen the labor movement and nurture future female union leaders. This year’s theme was titled “The Rising Tide of Change: Activism, Leadership – Union Women!” Delegates from across the country participated in workshops and panel discussions on networking and developing ideas for strengthening the voice of women in the workplace. The convention agenda included speakers, awards and the election of National Executive Board members. IAM Executive Assistant Diane Babineaux was elected National Vice President to the CLUW National Officers Council. Retired IAM member Joyce Ribbert of Local 837A in Hazelwood, MO, received the Clara Day Award for her continued involvement in her local and community. And, Local 1260 Educator Bonnie Polser, of New Holstein, WI, was granted the Gloria T. Johnson Women in Union Leadership Scholarship.